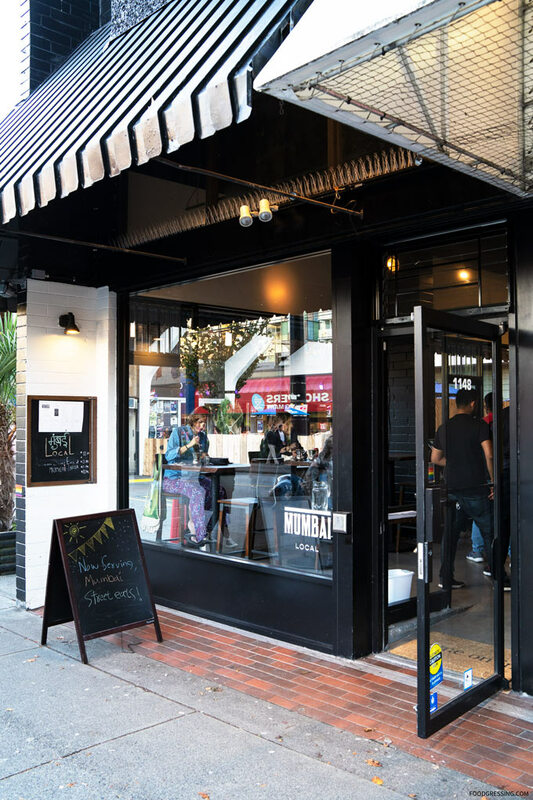 While Davie Village is home to several restaurants serving Indian cuisine, a newly opened eatery called Mumbai Local is setting itself apart. 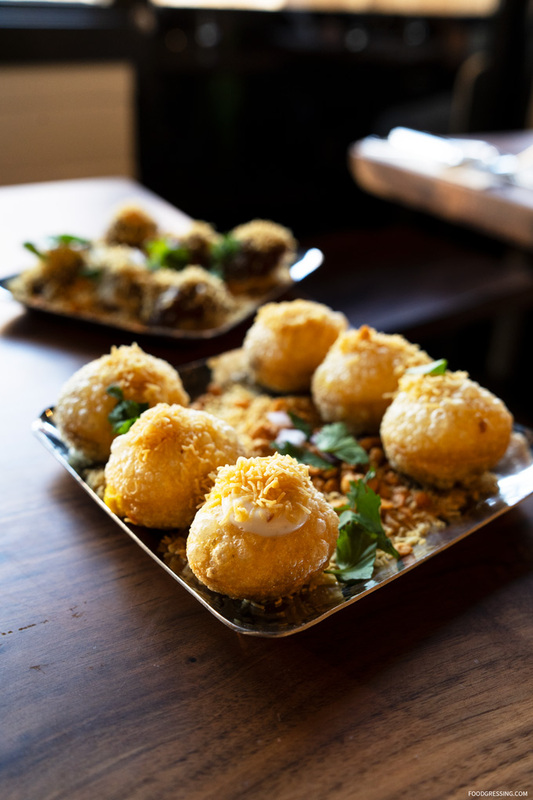 The restaurant is opened by Chef Tushar Tondvalkar (formerly of West Oak) along with a few friends to offer a menu that is inspired by street-style eats from Mumbai. Their menu looked interesting so I decided to try them out for dinner last month. Note: This is not a sponsored post. The food in this review were not complimentary. Opinions are my own. The interior of Mumbai Local is designed to mimic the vibrancy of the city of Mumbai. I really liked their bright yellow mural that pays homage to the city but also has makes a nod to Davie Village. 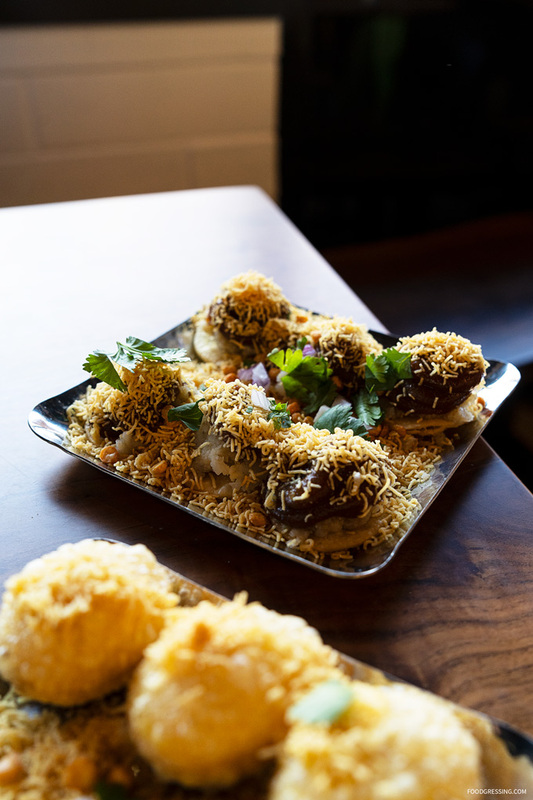 The menu starts off with chaat (snacks) where puri (flat or hollow crackers) are offered with different options of toppings and fillings ($7). 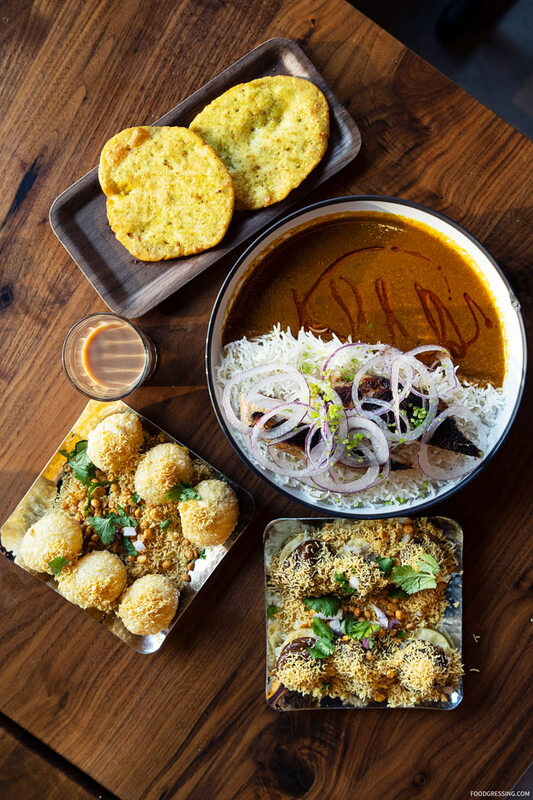 From 11 am – 3 pm, they offer a four-layer tiffin box ($15 – $18) with your choice of daily special stew, rice, local bread, dal (like a soup) and condiments. From 3 pm onwards, they have a variety of street-style eats ($7 – $12) including Masala Toast Sandwich, Chicken Lollipop, Masala Lamb Chop and so forth. 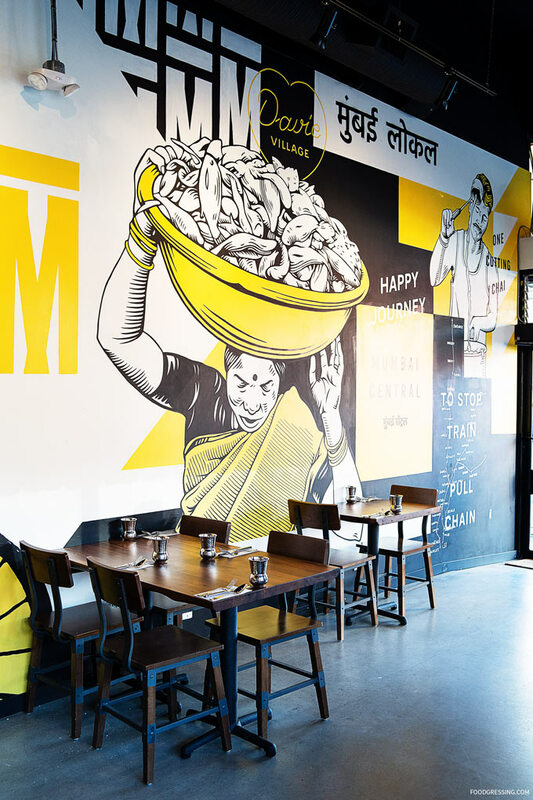 For dinner ($14 – $20), they offer entrees like Missal Pav (spicy sprouted bean stew), Hakka Noodles, Mumbai Special Pav Bhaji (mashed mix vegetables cooked with butter and spices). Sweet treats are also unique ($5 – $7): Falooda (rose milk with vermicelli), Shrikhand (sweet hung yogurt), and Guava Kulfi (guava ice cream). Their menu can be viewed online. You’ll find a few Indo-Chinese dishes on the menu like the Chicken Manchurian Dry (chicken cooked in Indo – Chinese Manchurian sauce, with scallions and cilantro) and the Hakka Noodles (noodles cooked with vegetables in Hakka sauce topped with scallions and served with sunny side up egg). Mashed white peas stuffed in hollow crackers served with sweet tangy pani. The cracker shell was very light and crispy while the mashed white peas filling was very smooth. It was advised to eat these quickly as they can get soggy if you wait too long. A mixture of potato, onion, shev and raw mango delicately placed on flat crackers, drizzled with tamarind and chili chutney. This was an interesting dish from a texture standpoint while I enjoyed the spicy, sweet and savoury flavours. Chicken cooked with coconut caramelized onion served with rice and vade. This was a very homey, comforting dish and I really liked the coconut flavours in the curry. 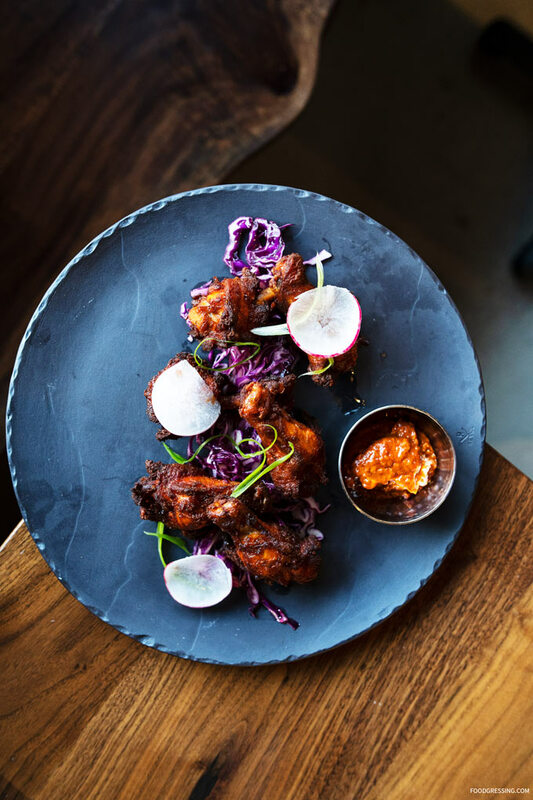 These chicken wiglets had an Indo-Chinese twist being served with schezwan chutney and cabbage slaw. The outside was nicely charred and the meat was tender and juicy on the inside. I liked the mix of spicy and tangy. Perhaps a little pricey for just ice cream on a stick, but I liked the novelty factor. 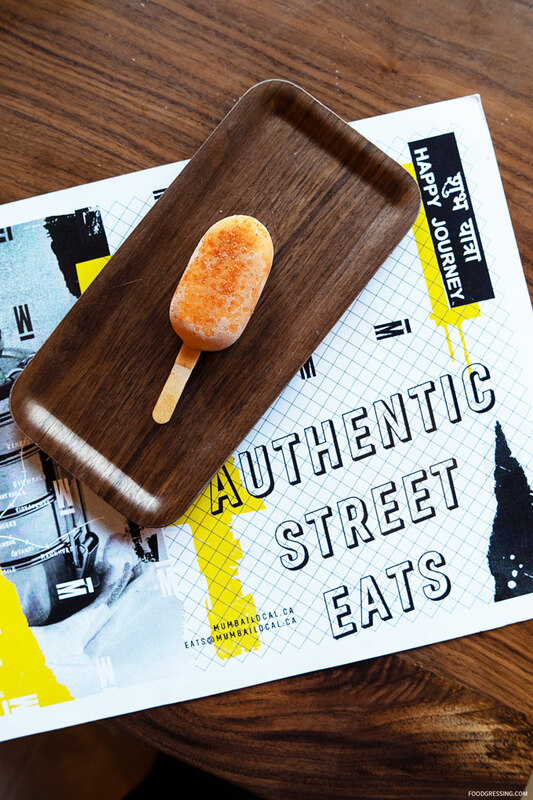 This dessert consisted of guava ice cream on a stick, sprinkled with chili salt. You get the spiciness from the chili salt on the outside and then the sweetness of the guava ice cream on the inside.